Anne Garee came in this weekend and did a full regulation on our Yamaha C7. All I can say is AMAZING. I feel like the dynamic range on the instrument has doubled. The action flies and the play in the pedal is completely gone. I sat late in the evening playing Shumann's Kinderszenen, which is my go to relax music, and the instrument felt like it was singing a new song. The melody sat on top without thinking and the accompaniment flowed effortlessly. I know there a more virtuosic pieces to test a piano with but the first movement tells me much of what I like to know. 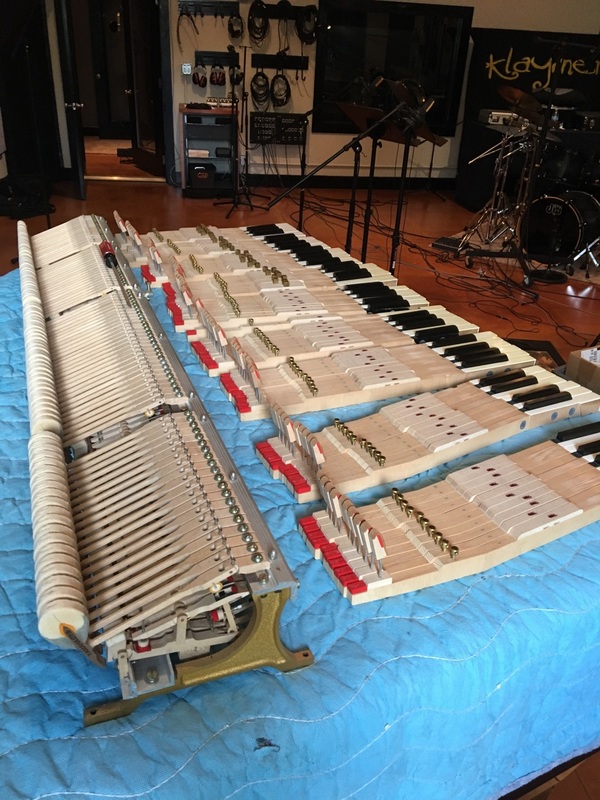 The piano had all the bushings ironed, which was an incredible process to watch. They keys were leveled, springs, pedal box, cleaned out and fixed and probably a dozen other things I've forgotten. Aftertouch and rebound are back. Everything is just faster and smoother. Voicing is one of those artistic choices that piano techs make that really can change the sound of a piano. Anne was masterful in this area. The shift of the una corda is perfect and the piano goes from delicate to roaring with ease. I also learned a feature about the Yamaha C7 I did not know. Apparently it has a tapered keybed similar to a Steinway D, meaning the keys are longest in the bass and shortest in the treble. This allows for an overall longer key length in the bass for the size of the piano. Longer key length means the down weight is more uniform from the back of the key from the front, and creates an action that is more even and responsive across the length of the key. This is a feature you typically only see in the full 9' Steinway Model D, yet somehow Yamaha manages to make it work in a 7'6" studio. In other words, a Steinway A or B doesn't have that feature. That's pretty interesting. A big thanks to Anne, she does impeccable work and was gracious to let me watch and ask a million questions. I am completely enamored with the results. I am excited to try a good jazz or classical recording session now. Any takers?